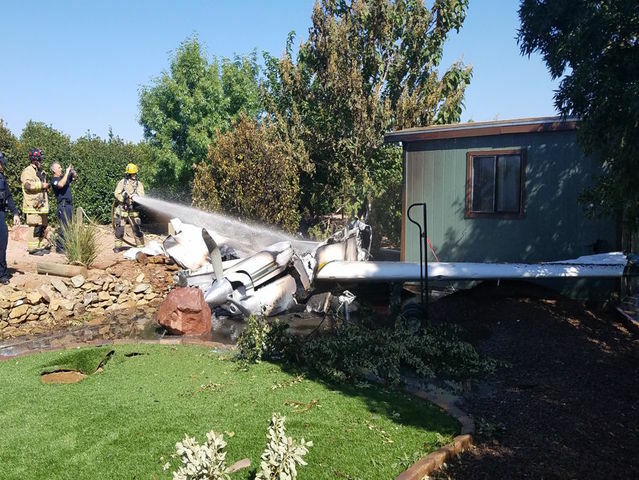 On September 17, 2018, about 0945 mountain standard time, a Beech F33A, airplane, N2031D, impacted a home, 1/4 mile southeast of the approach end of runway 32 at the Cottonwood Airport (P52), Cottonwood, Arizona. The airline transport pilot was the sole person on board and was fatally injured. The airplane sustained substantial damage and a postaccident fire ensued. The airplane was registered to a private individual and operated by the pilot under the provisions of 14 Code of Federal Regulations Part 91 as a cross-country flight. Visual meteorological conditions prevailed and no flight plan was filed for the flight that originated from North Las Vegas Airport (VGT), Las Vegas, Nevada about 0820, with a destination of P52. According to the owner, the airplane was based at P52. 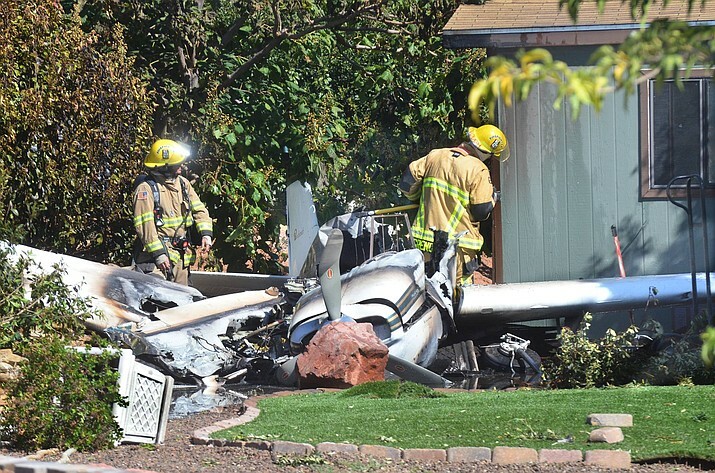 The owner asked the pilot to fly him to VGT, where the owner would pick up a truck that he planned to drive back to the Cottonwood area, and the pilot would fly the airplane back to P52. Although the trip from P52 to VGT was the first time the pilot had flown in the accident airplane, the owner had previously flown with the pilot a few times in other airplanes. The pilot flew the entire leg uneventfully, and the owner stated that he felt confident in the pilot's flying abilities. After landing at VGT, the pilot left the engine running while the owner exited the airplane. The pilot departed VGT in the airplane shortly thereafter. Ground scars and wreckage distribution indicated that the airplane impacted the roof of the home; a landing gear wheel and strut were found in the home's attic. The airplane then impacted a tree and a bush before impacting the ground in the backyard of the home. The bush exhibited cut branches, which was consistent with propeller blade strikes. The right wing had leading edge impact damage, and the right wing inboard section and cabin area was mostly consumed by postimpact fire. The left wing was mostly intact and trace amounts of fuel from the wing was collected during the recovery of the wreckage. According to a first responder, the pilot had initially survived the accident, and he was found outside the airplane, about 15 feet from the airplane. The first responder recalled that the pilot stated that the engine had quit while the pilot was trying to land at P52. Other witnesses in the area did not remember hearing any engine sound prior to the airplane impacting the home. The owner stated that upon landing at VGT, the airplane should have had enough fuel for 4 more hours of flight time. The accident occurred about 1 hour 25 minutes after the pilot's departure from VGT. The airplane was manufactured in 1978 and was equipped with a Continental Motors IO-520 series engine. The airplane was registered to the owner in 2014. P52 was situated at an elevation of 3,560 ft above mean sea level. It was equipped with a single paved runway, designated 14/32, which measured 4,252 ft by 75 ft. P52 was not equipped with an air traffic control tower. The 0935 automated weather observation at Sedona Airport (SEZ), Sedona, Arizona, located about 16 miles to the northeast of the accident site, included winds from 150° at 4 knots, visibility 10 miles, and clear skies. 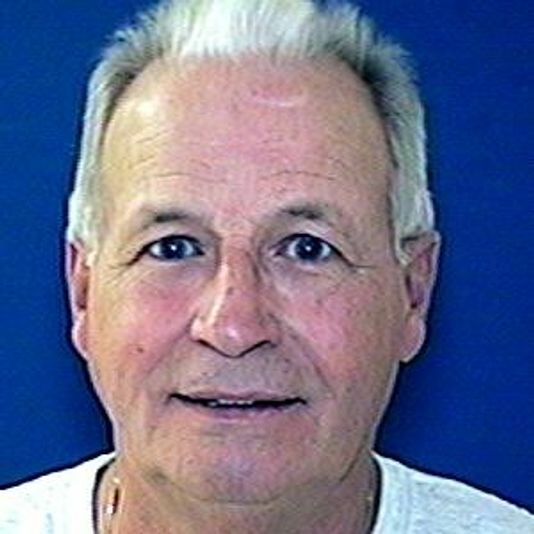 Joseph Kreiner, 70 of Clarkdale, passed away on Monday September 17, 2018 at the Maricopa Burn Center. He was born on September 20, 1947 in Brown City, MI to Anthony and Mary Kreiner. Joseph attended Brown City High School from 1961-1965 and received his diploma. He served his country in the Air Force as Sergeant during Vietnam. Joseph worked as an aircraft mechanic in the Air Force; for the Air National Guard and Air Reserves as crew chief and FH engineer; a commercial pilot for ATP; FAA Air Traffic controller; truck driver; corporate cargo pilot with Chrysler Pentastar Aviation and Active Aero Charters; pilot for Casa 212 cargo aircraft for UN in Angola, Africa; Captain for Boeing 727 for Kitty Hawk Air Cargo and office manager for H & H Trucking. Joseph enjoyed flying. He just loved to look out and down at stuff. Another interest was being self-employed and running AMSOIL Synthetic Lubricant business. Joseph is survived by his wife of 30 years Lucie Kreiner; sons Kit (Kim) Kreiner of AZ, Dennis Kreiner of AZ, Ryan Brown (Hannah) of MI and Josh Schwier of MI; daughter Terri Nelson (Scott) of IL and 8 grandchildren. Memorial services will be held at the VFW Post 7400, 705 E. Aspen Street in Cottonwood on Wednesday, September 26, 2018 from 1:00pm-4:00pm. In lieu of flowers and gifts, please make a donation to the VFW Post 7400, 705 E. Aspen Street, Cottonwood, AZ 86326. Kuhlt stated in a news release that the Beech F33A Bonanza was on fire when authorities arrived. A neighbor, Mike Zemky, said he saw the plane crash. Zemky said the pilot seemed to be doing "OK."